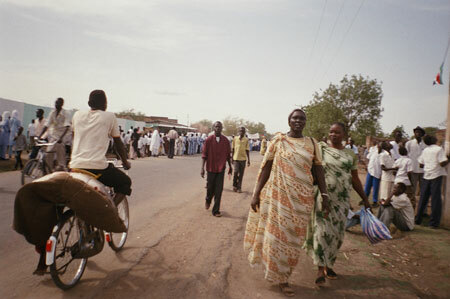 Two Shilluk women in the streets of Malakal during the ceremonies held there in July 2006 to mark the first anniversary of the death of John Garang. A man cycles past them carrying a Nile Perch on the back of his bicycle. Morton, Chris. "Garang anniversary in Malakal" Southern Sudan Project (in development). 03 Jan. 2006. Pitt Rivers Museum. <http://southernsudan.prm.ox.ac.uk/details/2007.137.35/>.